In honor of the new year - Welcome 2018! 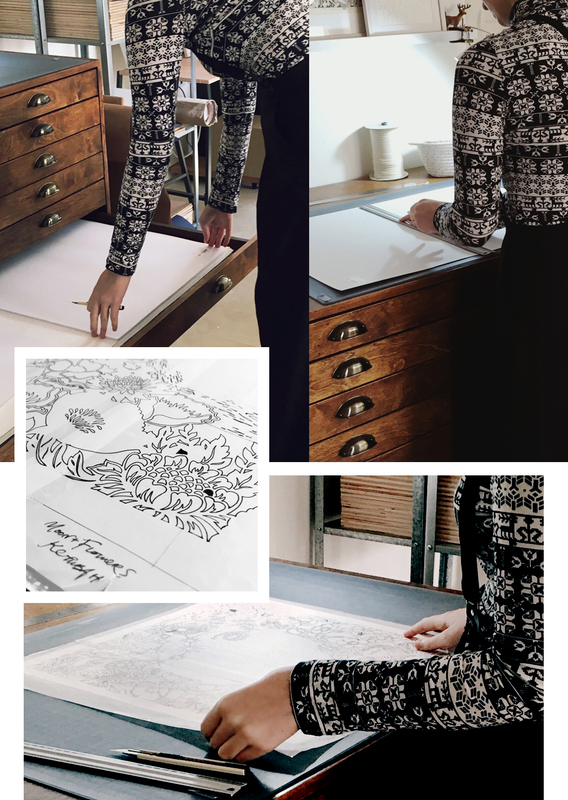 - I thought I should share with you a day (or so) in my studio, wherein I prepare a ketubah from start to finish. I've made an effort lately to document more of my work day, which involves imploring visitors to take a picture or setting up a finicky tripod with a delay trigger... My gosh, I sound technically challenged. But my work is solitary, so them's the breaks. The photos are from different orders but together they give a complete picture of the process. 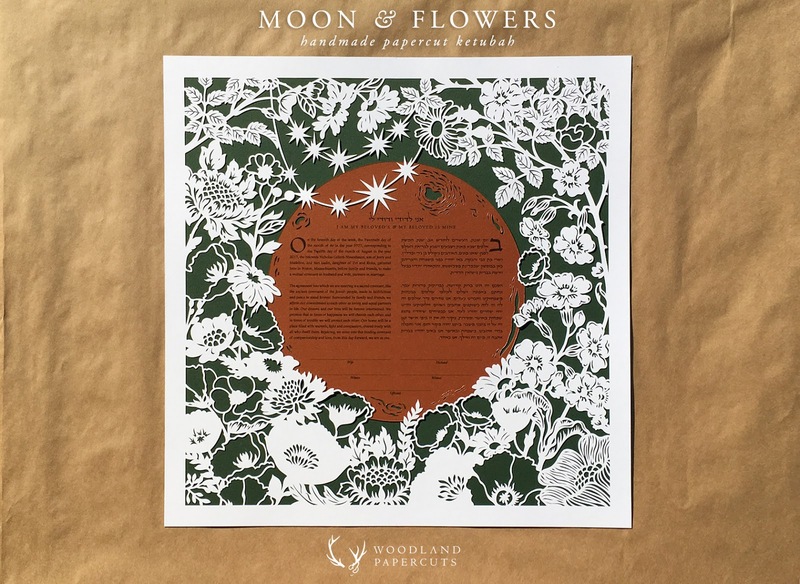 Follow me on the journey to make the bestseller MOON & FLOWERS ketubah. In this current studio setup I have two work stations: a tall chest of paper drawers and a long sit/stand workbench. For those of you who are interested (I know I always am!) the drawers are not store-bought. I had them made to my specific design by a local carpenter after I was obsessed with vintage flat file/map cabinets for over a year. I was stalking furniture sites and kept a photo folder on my desktop, that's how obsessed I was. There's a great saga about how these drawers came to be and moved several studios with me (they even have a war wound or two to show for it), but probably only interesting to me and my family. You don't have a full view of the desk here (which lowers and raises with the use of a crank) but it is also handmade, a DIY masterpiece by my talented sister. Back to the art: I start every order at my papers station. I have a favorite paper I use and I have it cut and stored in full sheet-half sheet-quarter sheet. I used to stock only Fabriano Accademia, but after a bad experience with my last order (read more here) I changed to Canson stock. Like anyone I have my habits and favorites and sadly it took a big shakeup to have me try new papers, but I started out papercutting by trying many different paper mills, collections, and weights until I found the one most suited to me - and I encourage all new papercutters to do the same. My paper drawers are filled with different papers, most I still use today for different papercuts. Once I have my paper cut to size and fitted over the design template, I move over to my workbench because that's where my iMac sits and I can't work in silence. I sit (or stand - the table rises!) and papercut while watching movies or listening to audiobooks. (I need more audiobooks.) I wrote about my YouTube work playlist here, if you want to go down that particular internet rabbit hole. When I started I used to trace my designs onto paper on a window or using wonky light box a janitor at uni DIY'd for me. Both options got really hot, it was always a painful position, and I kinda miss it, but I've since invested in gorgeous light pads that are like magic (read more about my tools here). Tracing takes several hours because I'm slow like that. Wondering how slow I go? check out the video above. Once tracing is done I move on to cutting. Looking at all the photos now the progression of time is very obvious. I started in a bright sun-filled room and worked through to the next morning. Cutting at night is like sleeping sometimes, because you get in a trance and your mind rests. I find I'm much more ...productive, when it's the dead of night and only I and the wild foxes howling outside are awake. This is a classic case of do as I say not as I do though, you should definitely manage your time better than I do mine and go to sleep. The two most important accessories for a papercutter are a good self-healing mat and a bright lamp. I still haven't found my perfect cutting mat (there seems to be only one brand stocked in the entirety of Israel), but I use what I have until they're in tatters, flipping them upside down and reverse side up until all surfaces are roughed up. Honestly, I almost don't want to throw them away when I'm done with them because they're like memory-catchers to me. They last for years each, so they do good. I don't remember why I first thought of getting a magnifying lamp - I think I got the idea after seeing magnifying glasses in a cross-stitching magazine - but it has truly filled a need I didn't even know I had until I first used the lamp. For those interested, the lamp is mounted to the desk like an architect lamp but also has a mobile stand you can purchase separately. You an find these lamps at professional beauty supply stores, they're for beauticians. I've had mine for 6 years now I believe and it gives the perfect light, it doesn't heat up, and the magnifying glass has saved my eyesight. As you can see I like to marathon my papercutting. I measure the passage of time by what's playing on the iMac. (I think I played all four Lethal Weapon movies when I cut this one.) Every papercutter has a method to their madness, where they start cutting and how they continue until it's done. I think photos of the papercut "emerging" from the blankness of the paper are the most beautiful on my instagram feed. 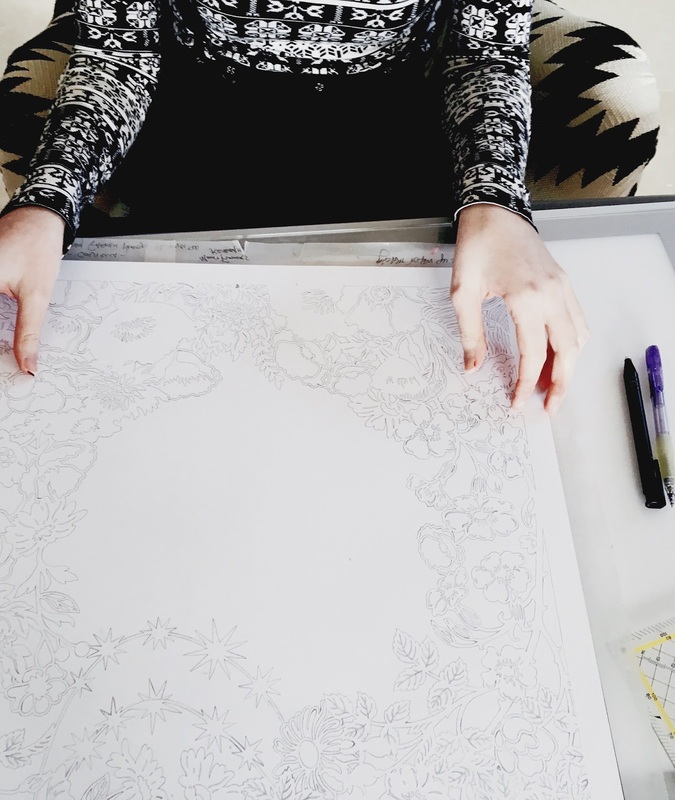 I've said it before and I'll say it again, to me seeing any art in progress is like watching magic unfold. I always start by cutting the straight lines all around the border, then I pick a bottom corner and work my way around. With nearly all my ketubot I make the text a separate layer from the design. 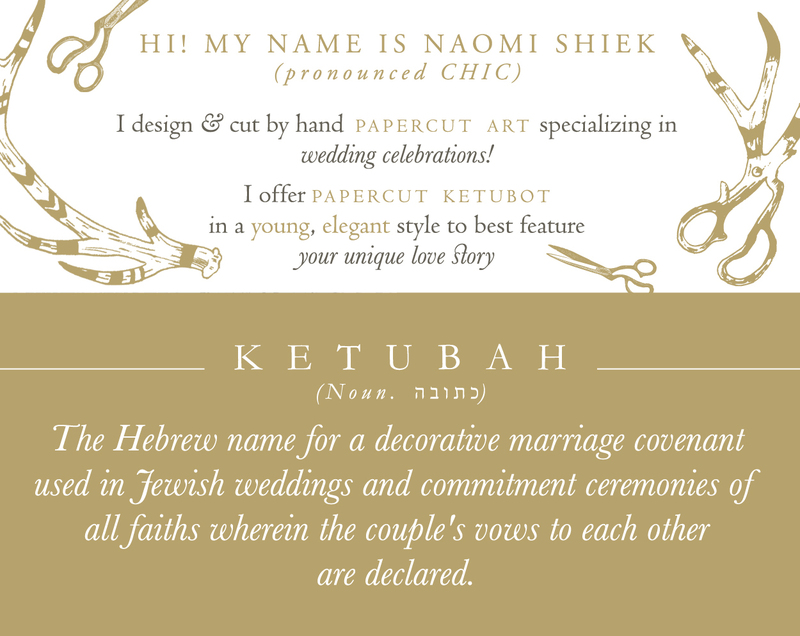 I used to insist on cutting the ketubah from a single layer and that's how I started, but once I introduced color to my options I found that separate layers add interest while also streamlining the process (no need to wait for the clients to approve the text before cutting, no panic when they want to change the text after I already cut the ketubah). 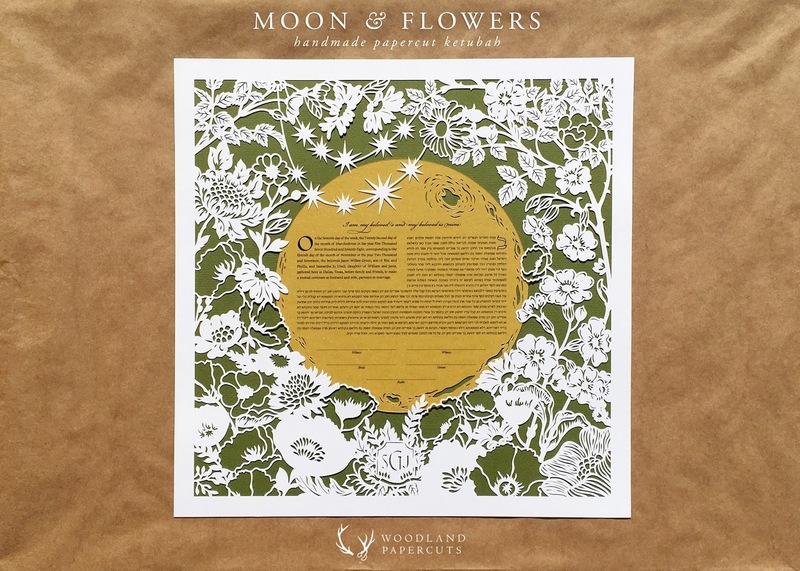 The Moon & Flowers ketubah has a unique text layer that needs to be papercut as well, which is an interesting challenge every time. For the order pictured below the clients selected a light-color-paper for the text layer, so I used the lightpad to make sure I didn't overlap the text and kept it levelled and centered when I drew the moon on the reverse. After cutting I centered the moon in the layout and marked where the two layers overlapped and I needed to cut the excess. At 3AM the glow was mesmerizing. 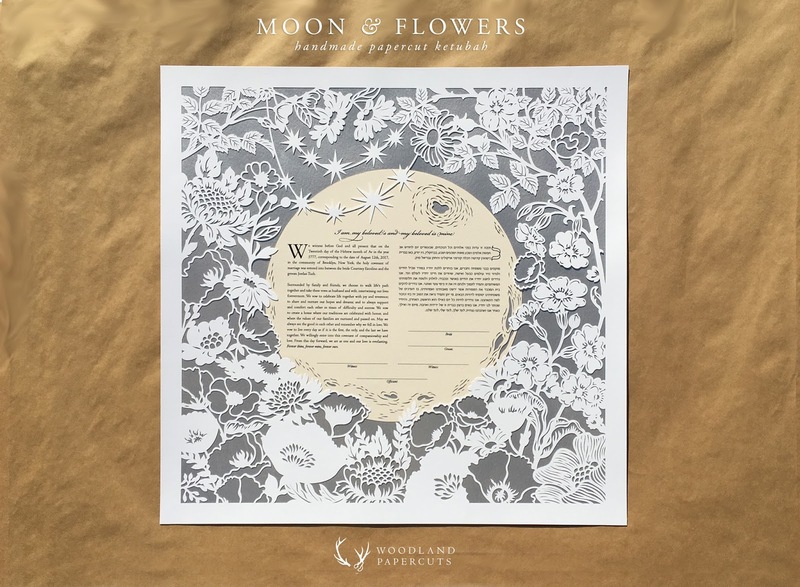 By morning this incarnation of the Moon & Flowers ketubah came together: Paired with hand-painted silver background, this pale beauty shone bright with a tranquil air about it. In contrast, the next papercut incarnation pictured below has a deeper color scheme giving it a 'moodier' vibe. Which would you choose? I'm actually surprised by how much a papercut changes with the colors the clients choose. That's why I love what I do - every ketubah is a reflection of the couple who commission it, and the bespoke nature of the handmade makes every order personal and unique. Take for example this vibrant incarnation I made for Sam & Jason that was customized with the couple's wedding crest. The photos of it are some of my favorite I took last year! After I photograph my work, I wrap each order with care in my signature packaging. My packaging is simple in concept - I chose it foremost for its durability - but I take care to wrap each papercut so it feels like opening a gift, in honor of the art treasured inside. 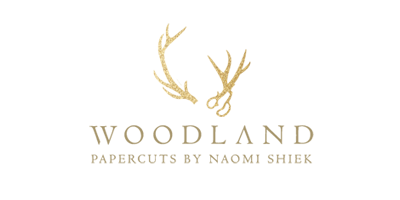 Each papercut is placed between two branded wood boards, secured with special Italian ribbon, and topped off with a personalized note. From when the ketubah is packed up and waiting for pickup until it arrives safely to its owners I am anxious, so there's nothing better than getting back feedback and beautiful photos of it in use! We were so proud to sign it and show it off to our guests under the chuppah! We adored working with you and can’t wait to hang it up in our home! Thanks again for playing a big role in making our wedding memories so special!